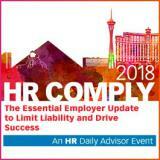 HR Comply (formerly the Advanced Employment Issues Symposium) is the nation’s leading human capital management conference for HR professionals, executives, and in-house counsel. The superior content and expert presenters will help you get ahead of workplace policy updates with a one-stop, all-bases-covered overview of breaking updates and proven best practices. This powerful 2-day workshop in perfect for new and seasoned managers who desire to increase productivity and promotability within their organization.